This is the question I kept asking myself as the New York Islanders took advantage of a long traveled Phoenix team in the first, and earned some fortuitous bounces in the second. The final score would be a 6-1 victory. Although not an indication as to how close the majority of the game was played, the team’s performance is a clear sample of just how far the New York organization has come. It’s not that the Coyotes are a bad team. Under Dave Tippett, the ‘Yotes have made the postseason 3 out of the last 4 years. After lacking some juice in the first, Phoenix came out hard in the second period, and until John Tavares’ fluky second goal of the night, the game was well within reach. The difference with last night’s Islanders’ performance was a maturity to deal with a pressing team that would not have been as evident in previous years. This is a team that creates their own fortune. In years past, for the Isles to compete at a playoff caliber level, they had to bring their “A” game. Watching last night as the score escalated, it was obvious the Islanders were somewhere around their “B/C” game. What would the score have been if the “Penguin series Isles” showed up? This team has raised the bar. It feels that the Islanders’ have a roster with a handful of players that are really coming into their own. Some will comment about how deep the team is this year. Depth aside, this team features a “core” of players that are finally ready to make their presence known in the NHL. Specifically, the Grabner – Nielsen-Bailey line. Grabner looks faster, Nielsen is much more potent rushing the puck, and Bailey is showing an all-around game that is starting to validate Garth Snow’s draft decision. It’s crucial for this line to continue to produce. 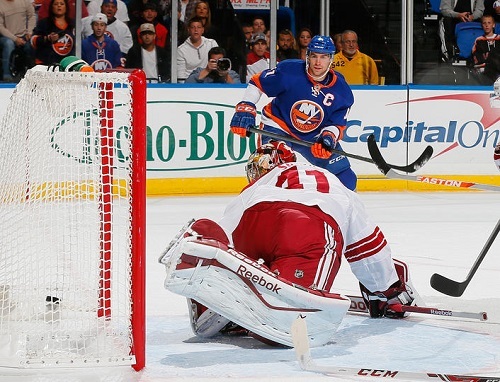 John Tavares scores his first goal of the year to give the Islanders a 2-0 lead in the first period against the Coyotes on Tuesday, October 8. Friday will be a good test for the Islanders. After a successful mini homestand to start the season, they travel to Chicago to play the defending Stanley Cup Champs. A repeat performance of last night will probably not end as fortuitous, but the signs are there that last year’s playoff berth was not a fluke. New Islander Cal Clutterbuck gets ready to make his debut with the team. The forward was taken off IR on October, 9th. Moving Reinhart back to his jr club was inevitable. Reinhart seems disappointed by the decision, but he’ll recognize that New York is becoming an organization where spots have to be earned. He’ll be here at some point, but it’s tough to say that he’s one of the team’s top six at this moment. Now that the team’s cleared space to get Clutterbuck back on the roster, the second question before Friday is who will sit against the Blackhawks? I don’t see Clutterbuck staying out of the lineup given he just signed a 4 year deal. The team wants to see what he can do. The choice will probably come down to Brock Nelson, Peter Regin, or Pierre-Marc Bouchard. Nelson might seem like the easy choice, but I literally haven’t seen anything negative said about the kid since he’s been here. That leaves PMB & Regin. Bouchard, although a veteran with a proven track record, is only on a one year deal. He’s shown some glimpses through the first 3 games, but quite frankly, he falls quite low on the “importance tree” in the organization. You can say the exact same thing for Regin, but to me, he earned his spot Friday night with that snipe in the first period against the Coyotes. Let’s see what Cappy decides.